iPhone 8, beyond sporting the faster next-gen A11 CPU and the new iOS 11 operating system, also comes to us with a bigger yet clearer display with a 5.8 inch iPhone 8 with 2800 x 1242 resolution (521 ppi). And supported with a 2800mAh capacity battery, iPhone 8 is able to sustain 14/24 hours for 3G talk and 250/384 hours for standby. Now that the iPhone 8/8 Plus offers us such a splendid resolution for video enjoyment and provides us a powerful battery life, it cannot be too gorgeous to watch videos, to name a few, the videos from YouTube. But watching YouTube video online with iPhone 8 requires a fast internet connection or WiFi, which is not everywhere though. So if you want to play YouTube video on iPhone 8 without any barrier, you should download and turn the incompatible YouTube FLV video, to be the new iPhone 8 and iPhone 8 Plus friendly. Luckily, you are not alone. MacX Video Converter Pro gives you ultimate control over your YouTube FLV videos and makes any YouTube videos playable on your iPhone 8/8 Plus/X, iPhone 7/6s/6/Plus/SE etc without any problem. It especially helps Mac users to download YouTube video to iPhone supported video format with faster speed and intact quality. Below is the step-by-step guide on how to convert YouTube FLV to iPhone 8 easily. Fastest YouTube Converter for iPhone 8! World's No.1 fast YouTube video transcoder to free download HD/SD videos from YouTube 1000+ sites and convert to iPhone X/8/8 Plus/7/6S/6S Plus with 5X faster speed. After free downloading and launching this killer YouTube downloader yet converter for iPhone , click "YouTube" button on the main interface, the built-in YouTube Downloader window will pop up automatically. Then copy and paste the YouTube video URL to the address bar. Then click "Download Now", after a few minutes, the downloaded video will be automatically added to the convert list. Choose the output format as you like. To play YouTube video on iPhone 8, simply select iPhone 8 recognized format like H.264 or MPEG-4 as the output format. This program also offers optimized profiles for the specific mobile devices. So you can hit Apple Device -> to iPhone -> iPhone 8 -> Press Done to do the conversion. Click "Browse" button in output setting area to save your output movie. Step 4: Start Converting YouTube to iPhone 8/8 Plus. Hit the "RUN" button to start decoding the downloaded YouTube video to iPhone 8 on Mac. After a short period of transition, you can sync the YouTube video to iPhone 8 for playback without limitation. 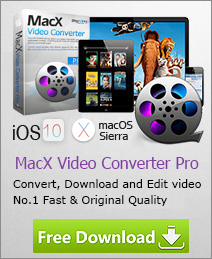 Attributing to its built-in 370+ video audio codecs, MacX Video Converter Pro clears all obstacles and allows you to convert any video to a myriad of iOS and Android gadgets, e.g. transform MP4 to iPhone 8, M2TS to iPad, MKV to Android, etc, so that you can get your videos shuttled among diversified photos and tablets without worrying about format incompatibility.